I got a chance to visit WM for the first time in awhile this weekend, and as others have mentioned, they are just swimming in Indy product. The regular aisle display is packed full, as well as an endcap overflowing with the stuff. I also saw the Jungle Cutter several times at both WM and TRU. I think the line is selling ok, but may be slowing the further we get away from the movie. I also think, aside from an Indy figure here or there - or maybe the role playing stuff - that this line is even more collector driven than Star Wars. I haven't really seen kids looking at the figures at all, just the whip. My Targets are bare (no Indys besides AH, also no IM stuff except the Hero line. I guess those aren't as popular as the SW one) but my favorite W*M is stuffed. Maybe they re-stock often. In my opinion and observation of the Chicago area Target and TRU moved through their inventory in a healthy manner. WM's seem to be overstocked. I went to 2 different locations and they were jammed packed with everything. anything other that the LC wave you can find. Do not be surprised if WM does not continue to carry the line. Target & TRU should be a safe bet that it will at least continue for awhile. Before today I would have thought the line was a success, but after visiting 4 Wal Marts, I would have to agree that Wal Mart will kill this line in their stores pretty quick. Endcaps PACKED with Wave 1 and 2, shelves PACKED under loaded pegs. I even saw the Deluxe pegs full, Horse, Motorcycle and Ark Indy even. Target is a bit more picked over and Tru seems to move product a bit too. Yeah, the same thing has happened here. WM is just loaded with Indy right now, with an endcap full of the first two waves, and the area in the "regular" aisle is packed to the gills as well. 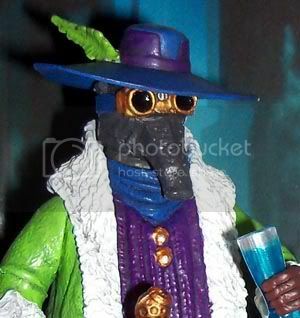 Target seemed to put some new stuff out this week, as I saw some of the KOTCS figures again (including Indy w/jacket). I grabbed an extra Indy w/Jacket that had real nice paint. Actually, I think that might be the best overall Indy figure so far, aside from the overly large removable hat. TRU has had the same stuff since their sale I think, although they have had a couple Jungle Cutters sitting there since then. How does everyone think the line is doing at this point? I haven't seen the newest TLC wave at retail yet here, but each time I look it seems like things are starting to hang a bit now. WM in particular has gobs of figures, even the basic Indys (who seem to be a little tougher to find at Target/TRU). I'm starting to see the vehicles a little more often too (the Jungle Cutter in particular), and starting to get tempted to pick up more of those. Anyways, I'm sure Hasbro has plans for at least next year for this line - but overall how do you think it has done now that the movie is a couple of months behind us? No room at my stores really for much. I do think the line is a success, but I do not think it will last long. We have yet to see TLC stuff locally either. I'm hoping I will see them locally but I'm thinking I need to go online to order the ToD stuff before it sells out everywhere because I don't think that will hit Canada at all because of the backlog. The only caveat I'll put out there is it's not a good time at retail for sales of stuff like this. When the back to school stuff goes out sales tend to go up as well, so I'm hoping for improvement in sales toward the end of the month. If not, it's done up here. I think the line is in trouble. The movie is pretty much done and I can only assume most people have had their fill of the first two waves. Problem is (and this happens every time a new movie line is introduced) Hasbro ships too much of the first/second wave. We're swimming in them - everywhere. I don't have much hope on the TLC or ToD waves even hitting here. It's that bad. And the rumored price increases certainly won't help move the stagnant product. Great minds think alike Brent. Looking at the line now I'm not sure how much of a success it is. It sold well at the beginning but by July 1st it seems to be stagnant as far as sales go. WM had a huge cube put out about half way into June and the figures that sold the best were from the KotCS wave including the Russian Soldier and Cemetery Warrior. Now they're both hanging around. Target only ever had the first wave of Deluxe and sold through them. A little over a week ago they finally stocked the second wave with the German Motorcycle, Horse and playsets. They sold, surprisingly, since they've been sitting at WM for weeks now not moving. Both stores have sold the Trucks and Jungle Cutters well but now the JC is sitting at WM. Neither Target or WM has restocked the 4WD Car since the release. The 12" moved surprisingly well and didn't seem to be ordered heavily, a good thing, and now the Indy figures are scarce but Mutt and the German Soldier are around. Maybe a swordsman but he sold well also. Role play whip, I still see kids with that once in a while. I'm afraid it'll be a while till TLC hits here and I'm worried about TOD making at all due to the backlog of figures. Especially now that Cornell and IC are out, the buying market for items like these has all but dried up. Won't be back till the end of August and by then the SW stuff will be popping again so who knows how that will cut into the Indy market. I also think the first two waves were shipped too heavily and now 3 and 4 will suffer. There was too much of a break between them and TLC and the buzz wore off. I do believe we'll see a bump for the DVD release, especially if it's closer to Christmas. The price change is a real pisser! My Target was $7.49 for the launch and then, about mid June, dropped down to $6 something. That was for a couple of weeks, and they saw some sales, but then they bumped the price to $7.99 last week. Now, consumers aren't all stupid. People are going to realize that that the same stock that's been on the shelves since May has dropped and now increased to above the release price. This isn't milk or gas, they aren't a commodity...people know it didn't cost Target $7.99 a pop to put them on the shelf. My WM did the same thing with the 2005 exclusive line of 3" Titaniums. They were, what, $4.88? Then they bumped the price on what was in stock to $5.88 and then again to $5.99. It's now 3 years later and they STILL have 2005 stock on the pegs, with red clearance tags market, get this, $5.99! My WM store has stocked new Titanium vehicles TWO TIMES in three years. End cap of repaints earlier this year and the UGH Republic Gunship wave in 2006. I don't believe they sold a single new Titanium in 2007. Anyway, my big hopes for this line were doused about 2 weeks ago when I hadn't noticed anything missing from the pegs locally, the TLC wave started to hit in other parts of the country and, although the film is still in the top 10, the buzz has died off and I'm not seeing kids looking at the toys anymore. Unfortunately, I'm not expecting to get much further than the TOD wave unless something drastically changes with the DVD release. Christmas this year might be about it. Especially with the price hike. If there's another wave far enough along in production we might get it but I wouldn't be surprised to find them in Big Lots or Tuesday Morning. Actually, the stores I frequent (TRU and Target) both have very few wave 1 and 2 figures left, now I'm just waiting for them to restock with the TLC wave. I find it funny that Wal-Mart is choking on these, as they seemed to be the only ones who didn't have much out on May 1. People bought big that first day, and they missed out. Well, this sufficiently panicked me enough to order wave 4 from BBTS. I was kinda surprised by the pricing though: set of 6 new figures $74.50; case including those six figures $89.99. Yeah, ok. Obviously I bought the case. Thankfully I haven't been really ripping into the Indy figures I've bought thus far so I can take rocket launcher Indy and Temple Indy back to the store. I haven't bought any Mutt figures yet, but now I get the jacket version. So I'm only stuck with an extra Temple and Rocket Launcher Indy in my case. Not too bad. And it's still a little below retail up here, even after shipping. So in my case, not a bad deal. If I can unload those two extras, I'm laughing. But this does preclude ordering the case of TLC figures. Since they've hit retail though, I'm much less concerned overall about them and I do get the Indy anyway. The only place I've seen the Last Crusade wave is at WM, ironically. I knew they overdid it when I saw that four-sided display. I guess I better get a preorder in at BBTS for the ToD wave. That doesn't have a prayer of showing up here. And I still have to get a few figures from the Last Crusade. Edit- Nice. $75 for a set of 6 ToD figures. Man, I can remember when BBTS was close to retail in terms of pricing. Now his prices border along the lines of scalping. I still order a good deal from BBTS, but didnt with wave 4 because of the ridiculous pricing. I tend to pick and choose much more with them. I also order from BBTS a fair amount, but have noticed the prices creeping up a bit lately as well. Actually, I'd say I do the majority of online shopping through there (or HTS, when they have stuff in stock). Anyways, I did preorder the ToD wave as well (despite the high prices) as sort of a "just in case". Like others, I'm not sure we'll see this wave much here either (still no TLC wave either), and for some reason HTS won't let me order anything anymore (I always get an error message now). This way, I've got them preordered as a "backup" and can always cancel it if necessary.